BJ2102A Dual function bone drill. BJ2103B Dual function canulate drill. BJ2103D Dual function canulate drill. 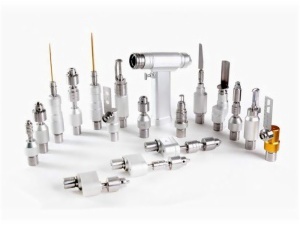 BJ2107B Dual function acetabulum reaming drill. BJ2107D Dual function acetabulum reaming drill. 1.Excellent torque for prosthesis replacement surgery. 2.Powerful motors can provide the best speed and power. 3.Extended capacity battery ensure the implementation of efficient operation. 4.The main components are made of high-strength stainless steel. 5.Optional external power supply system. 7.Single and multi-function mode for selection.